Window boxes and railing boxes can transform the look of a home or deck. When it comes to color combinations and plants, the sky really is the limit. You can even make an edible window box. The biggest challenge with window boxes is watering them. Because most don't hold a whole lot of soil, they require frequent watering. Remember this when you're planning your window box. Make sure you can easily reach it with a hose or watering can. Self-watering window boxes are also a great solution, but again, you will need to be able to fill the reservoir. This window box uses a layering technique to give it a luxurious look. Notice how the front row of plants drapes over the edge, hiding the moss lined metal, hay rack style window box. The second uses a layer of midsized, full, upright plants and the back uses tall up right plants. The contrasting colors pop, giving the design interest. There are many towns in New England whose window boxes will knock your socks off. Though downtown Wiscasset, Maine is tiny, there are several stunning window boxes. Every year I look forward to checking out the window boxes at Smitten, a lovely store in the center of town. The plants in the window boxes are always different, but the combination is imaginative, usually featuring contrasting colors. In this picture, the use of orange pansies and calibrachoa, along with the bright green creeping Jenny, white nicotiania and the deep purple of the sweet potato vine is stunning. Lettuce is the perfect plant if you want to grow decorative, yet edible plants in your window boxes. This wooden window box is filled with Elegance Greens Mix from Johnny's Seeds, which is delicious as well as being, well elegant. It's also really easy to grow either from seed. For more information on growing lettuce in window boxes. Ireland is window box heaven. They are all over and many are stunningly gorgeous. This window box is the perfect example of how a color can have great impact. The red calibrachoa and verbena are matched to the trim on the window frame and it looks great. The red also contrasts beautifully with the color of the stone. Don't be afraid to use just one color or plant. Sometimes simple can be simply fabulous. I think of Ireland as container garden heaven. There are container gardens everywhere you look. This stone railing box features brightly colored petunias, lobelia and fuchsia. This window box uses a pallet of yellows, whites and silvers. It makes the store front attractive and inviting. This simple white, wooden window box is elegant and lovely. Planted with geraniums, ivy and white bacopa, it enhances the front of the building and the display of antiques in the window behind it. This coco fiber lined window box is filled with verbena, lavendar, sweet potato vine, sage and calibrachoa. In Ireland, there are window boxes everywhere overflowing with blossoms of all kinds. 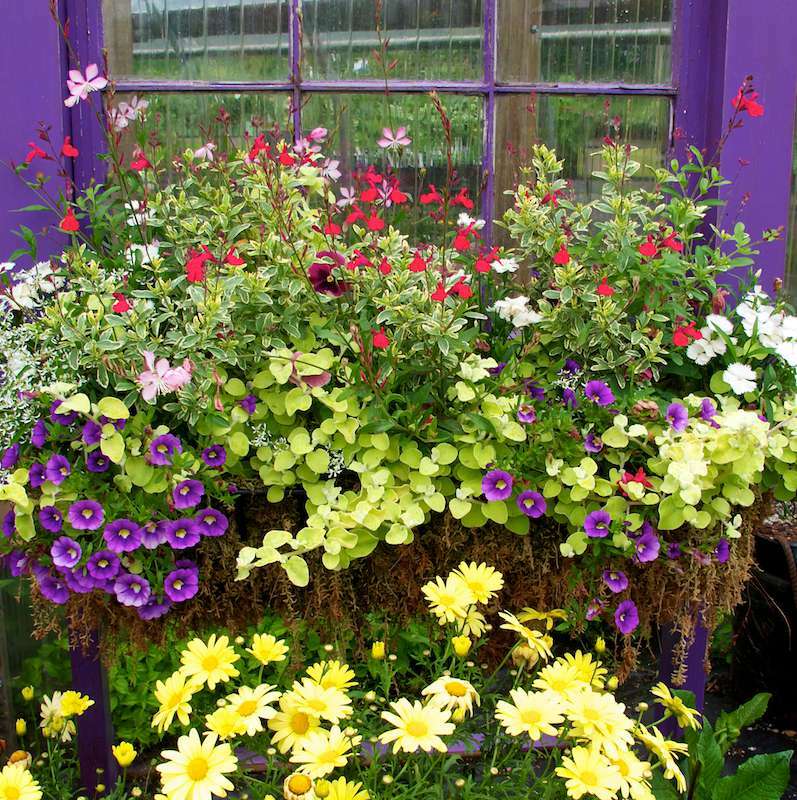 This window box, stuffed with different colored petunias, is simple yet lovely. I love the color combination of the ivory with pink and lavender. You can't go wrong with pink, white and green for a simple yet attractive color combination, especially when set off against the vibrant green of the window frame. This simple and beautiful window box graced a tool shed at the Berkshire Botanical Garden. It totally changes the building, making it both whimsical and interesting.